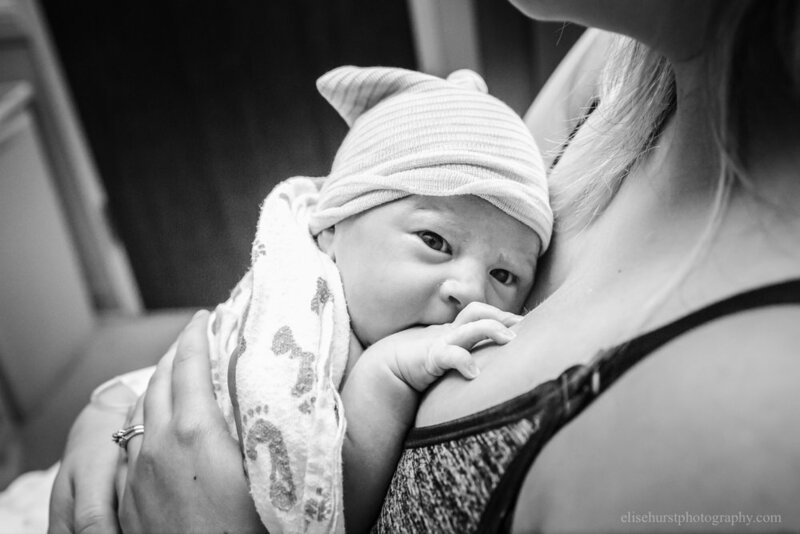 Elise Hurst bought our Birth Photography Toolkit when we first released it, and it's been a JOY to watch her passion and talent explode over the last year. Her work is bright and colorful; it brims with emotion. Each time she shares a new image, I find myself swimming in oxytocin. She has a true heart for the families she works with, and you can see it in the images she takes and shares. An artist's eye paired with a mama's heart results in GORGEOUS and MOVING images like these below. We're so excited to share this story! A few days after Hannah’s due date, her doctor and her agreed to an induction. I met them up at the hospital to document the start of her birth story. Hannah decided to labor without an epidural to allow for more freedom of movement during labor despite the induction. Once Hannah was settled in and Pitocin was administered, I thought we had a long road ahead of us before baby came. After being gone for 45 minutes Casey me a text saying, “They are breaking the water!" I rushed back to the hospital with Hannah fully focusing through back-to-back intense contractions with her eyes closed. This was transition. She did not make a sound, but the pain was evident when she would not even talk between contractions. Hannah's mom was by her side encouraging her through affirmations. Her doula and husband worked on different pressure points to relieve pressure, and her big sister came in as well for extra support. Within minutes, Hannah expressed the urge to push. The nurses strongly discouraged her from pushing to wait for her doctor to arrive. Baby number three was born without Hannah voluntarily pushing. The on-call doctor swiftly caught and placed baby on her chest. Everyone had waited with full anticipation for baby to be a boy as no one knew the gender before the birth. The look in everyone's eyes was sheer elation and surprise as they saw that baby number three was a GIRL!! Joyful tears and smiles filled the room knowing this was the last baby to complete this family. From induction to birth it was only around 3 hours and 30 minutes. I was shocked along with the nurses and doctor at her speedy process! Her doctor made it exactly one minute after baby girl was born. Birth's reputation will continue on for its notorious unpredictability in how it will unfold.